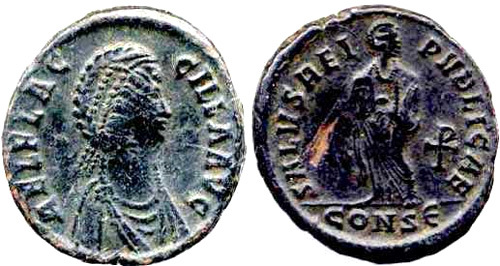 Aelia Flaccilla was the first wife of Theodosius Ist, and the mother of Arcadius and Honorius. She died in A.D. 386. 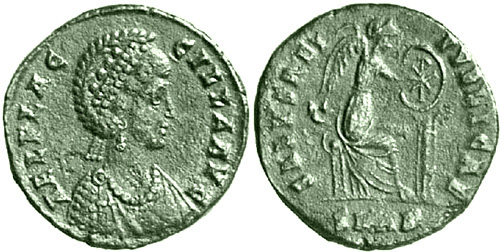 Reverse: SALVS REIPVBLICAE, Empress standing facing, head right, arms folded over chest. Mintmark ALEB. Obverse: AEL FLAC-CILLA AVG, Diademed, draped bust right with elaborate head-dress, necklace and mantle. Reverse: SALVS REI-PVBLICAE, in exergue : T/ANTB. Victory seated right on cuirass, writing Chi-Rho on shield held on small column. Obverse: AEL FLAC-CILLA AVG, draped bust right, with elaborate head-dress, necklace, and mantle. Reverse: SALVS REI-PVBLICAE, Victory seated right on cuirass, inscribing Chi-Rho onto shield held on small column. Mintmark ANTB. 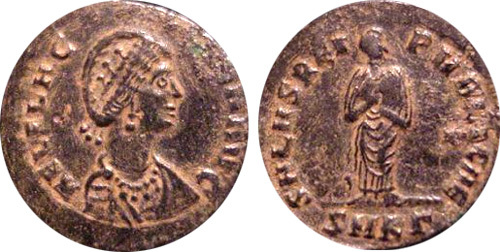 Reverse: SALVS REI-PVBLICAE, Empress standing left, heading right, arms folded on breast, holding scroll. Mintmark ANTE. Reverse: SALVS REI-PVBLICAE, Victory seated right on throne, inscribing a Christogram on a shield held on small column. Mintmark CONA. Reverse: SALVS REI-PVBLICAE, Victory seated right, inscribing a christogram on shield resting on small column. Mintmark: T/CONE. Reverse: SALVS REI-PVBLICAE, Victory seated right, inscribing a christogram on shield resting on small column. Mintmark: CONET. Reverse: SALVS REI-PVBLICAE, Empress standing facing, head right, arms folded over chest, chi-rho to right. Mintmark: CONSE. 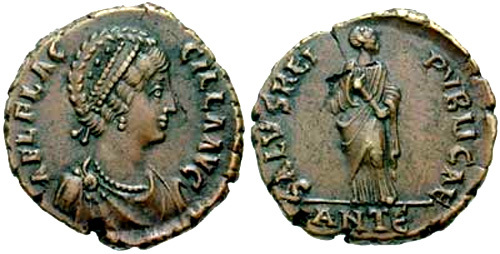 Reverse: SALVS REI-PVBLICAE, Empress standing facing, had right, arms folded on breast. Mintmark: SMKG. Reverse: SALVS REI-PVBLICAE, Victory seated right, writing chi-rho on shield resting on small column. Mintmark: T/SMH(officina). 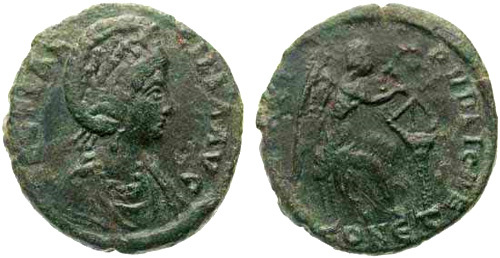 Reverse: SALVS REI-PVBLICAE, Empress standing facing, head right, with arms crossed on breast. Cross in right field. Mintmark dot SMHA. Reverse: SALVS REI-PVBLICAE, Victory seated right, inscribing a chi-rho on shield resting on small column. Mintmark BSISC dot. Reverse: SALVS REI-PVBLICAE, Victory seated right, inscribing a chi-rho on shield resting on small column. Mintmark TES delta.